This Sunday, the popular SBS family history show Who Do You Think You Are? will star the only Western Australian of the series, popular football commentator, Dennis Cometti. The family history specialists were lucky enough to attend a preview of the show last week and found it very enjoyable. Dennis’ sense of humour comes across as he tries to discover the story behind some very strong female characters in his family. Tune in to SBS on Sunday 10 February at 7:30pm. 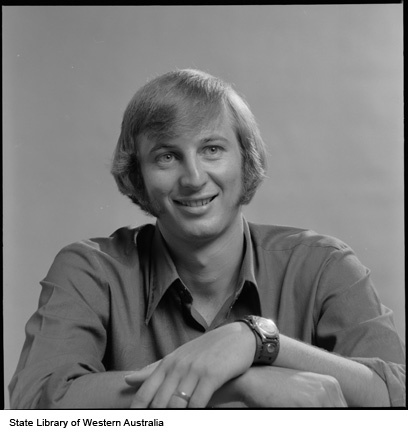 The image shown above is from the State Library pictorial collection and shows Dennis Cometti in 1972 (347344PD). This entry was posted in Family History and tagged celebrities, Family History, genealogy, television by triciaf. Bookmark the permalink. Hi Dennis, loved the who do you think you are. It seemed almost to parallel my life. My father came from Villa di Tirano, not far from Tirano I believe and always intended to take me there when I finished school, unfortunately he died at the age of 53, when I was just about to start High school, and I’ve always wanted to go there and check it out, but haven’t managed yet. I’m just a smidgen older than you (born 1948), and have no Italian language either. At times I felt like I was watching my own life being broadcast on the screen. My father came out to Australia in 1925, when he was 17, but was in his 40’s when I was born. I hope you read this and realise there are others with the same story as yourself. I think many Australian immigrants have come from the area around Tirano. Please email me if you would like to know more. Yours sincerely Gloria Primmer nee Ferri. P.S my father’s mother’s family name was Togno, lots of them in the area, and I think they used the nicknames to differentiate them as you said. Bye! Hi Gloria, my name is Maria Morelli both of my parent were from Villa di Tirano – Severo Togno and his wife were very good friends of my parents, I remember them well, they attended family weddings and were regular visitors to our home. Dennis,I am undertaking family research for my Wife’s Great Great Grandfather CARLO BORROMEO. Since watching your programme I have discovered further information about Carlo’s origin – he was born in LOVERO which is near Tirano in northern Italy in 1855 and came to Melbourne in 1880. My wife and I are keen to go to Italy and search the records but because of language issues etc we need to do as much research prior to going and this leads me to contacting you. I anticipate that you would have had assistance before going to Italy and wonder if you would be kind enough to give me some guidance or refer me to a genealogist or a contact person either here or in Tirano who can advise me. Ideally, we should have a contact/appointment with a local Priest/official prior to our departure. I hope you don’t mind me contacing you but after watching your programme and my subsequent research there are many similarities. I know it has been some time (I only just picked up on this thread) but did you get any info on Carlo Borromeo as I may be able to help. My ancestors are also from Lovero and when there last year we were able to obtain photos of church records, some dating back to 1612. I am sure we would have details of Carlo’s birth, parents etc. Please reply to my email if you are still searching. (Click on Continental Europe, Italy, then select your province). The Tirano and Lovero records can be found under Sondrio. This covers events 1866-1911. However, given the nature of the Italian civil records, you can also go 1-2 generations further. FamilySearch also has tutorials on how to interpret these records – there’s a wealth of information stored within them! My interest is in the Gobetti and Panizza lines in Tirano and the nearby village of Cologna (plus further back we have Della Bona, Patroni, Garbellini, Rinaldi, Capelli, Rinaldi, Ferrari, Zapelli, Marchesi, Puiselli, Scarsi. If anyone is researching the Tirano area I have made my own index for each year noting the image numbers of each yearly index – I’d be happy to share..